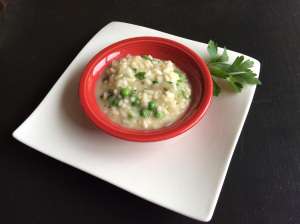 Risotto with Peas | Let's Eat! We’ve changed our format. Visit http://www.sundaywithachanceofmeatballs.com to check it out! We are making Risotto! I’ve made Risotto a hundred times but I always make it into rice balls and fry them as Arancini (see that recipe on sundaywithachanceofmeatballs.com). My daughter asked me to make it and serve it with our dinner tonight. We were having pork, but this is a great side for any meat and could be served as a main dish by adding chicken, shrimp or lobster!